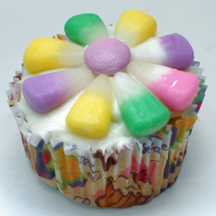 All it takes is pastel colored candy corn and M&Ms (available around Easter time, or at specialty shops) to make pretty flower cupcakes. What You Need: 1 cupcake; white frosting; 7 pastel candy corns; 1 pastel M&M. How to Make It: Frost cupcake. Place M&M upside down in the center of the cupcake. Surround with candy corn, alternating colors, with the white tips facing inward toward the M&M center. You’ll need to break out the decorating tips for this cupcake, but making daisies is easy, I promise! You don’t even have to have a pastry bag and metal tips. Just buy a tube of white icing (Wilton and CakeMate makes them) and the plastic, four-tip set. One of those is a “rose” tip: wide at one end and thinner at the other. How to Make It: Frost cupcake green. 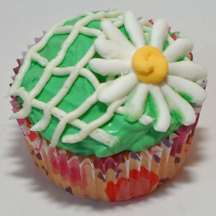 Use round tip to draw trellis pattern (grid) on top of cupcake. Practice making daisies on waxed paper (you can reuse the icing) before making one directly on your cupcake. Hold bag or tube with tip #104 perpendicular or at a slight angle (daisies are very forgiving), with the wide end of the tip facing either directly away from you or directly toward you. Start about 1 1/2 inches out from what will be the center of your daisy, squeeze, and ease up on pressure as you pull tip toward center. Repeat around. Use #3 tip to pipe yellow center. 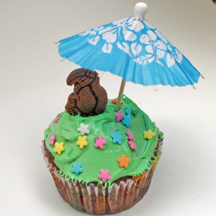 Get those umbrellas out of drinks and onto cupcakes! You don’t have to use toucans; other animals would be just as cool. Make That Cupcake! : Tint icing green and frost cupcake. Add umbrella, toucan and flower sprinkles. That’s it! The secret to these cute cupcakes are those little candy dots that come on a strip of paper. (Necco Candy Buttons) You could make a whole bunch with various colors of butterflies. 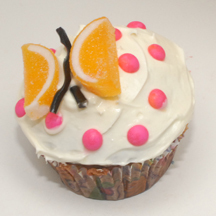 What You Need: 1 cupcake (baked and cooled); white frosting; candy dots; mini sugar-coated fruit slices; black licorice laces. Make That Cupcake! Frost cupcake. Place two fruit slices with round sides together and a small space between them. Cut two small lengths of licorice laces and place in middle for antennae. Peel candy dots off paper and place randomly all over cupcake.